Two bits of news have come out of the Garmin camp today—the first of which involves Samsung phones getting their own navigation software based on the Garmin Mobile(TM) XT platform. The software will be available on smartphones like the i780 in Europe and elsewhere starting sometime in the next few months. 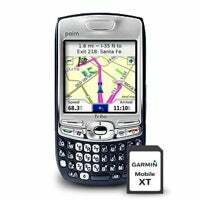 Futhermore, Garmin Mobile users will be treated to upgrades including a new Nuvi-like interface and the addition of Google Local search starting in July. Press releases are available after the break. 2008, at the CTIA Wireless trade show in Las Vegas. dynamic content such as traffic, weather forecasts and safety cameras. Garmin Online content varies by region. first notice the new nuvi-like interface, with "Where To?" and "View Map"
directly to a contact's address stored on their smartphone. smartphone must have a data plan for network access.